2018 has been a landmark year in the life of Vinitaly international Academy (VIA) with 38 Italian Wine Ambassadors and 4 Experts certified during courses held in two Asians cities, Chengdu and Hong Kong, and in Verona, Italy. With a grand total of 170 highly-specialized Italian wine professionals coming from all over the globe, 2018 has also seen the beginning of the next development phase for VIA to include a revised, tasting-intensive as well as new players that will oversee VIA’s growth: a new Chief Scientist, two new Faculty members, and four major Italian trade associations as part of the Institutional Advisory Board. 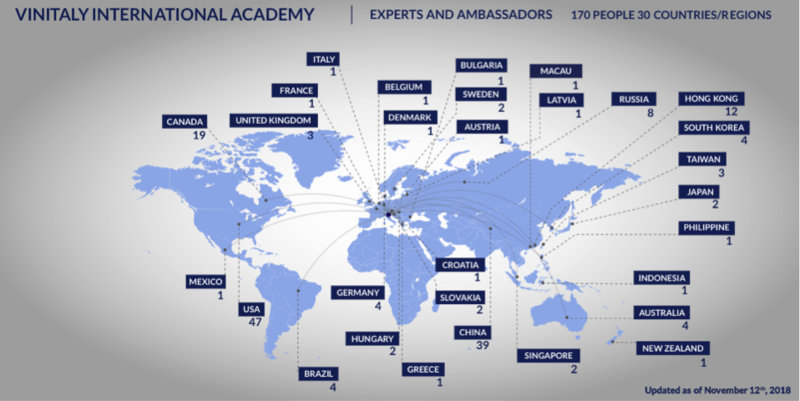 170 Italian Wine Ambassadors certified by the Vinitaly International Academy and operating in wine markets all over the world have been trained to the highest level since 2015 and are now promoting and educating about Italian wine culture in their respective countries. 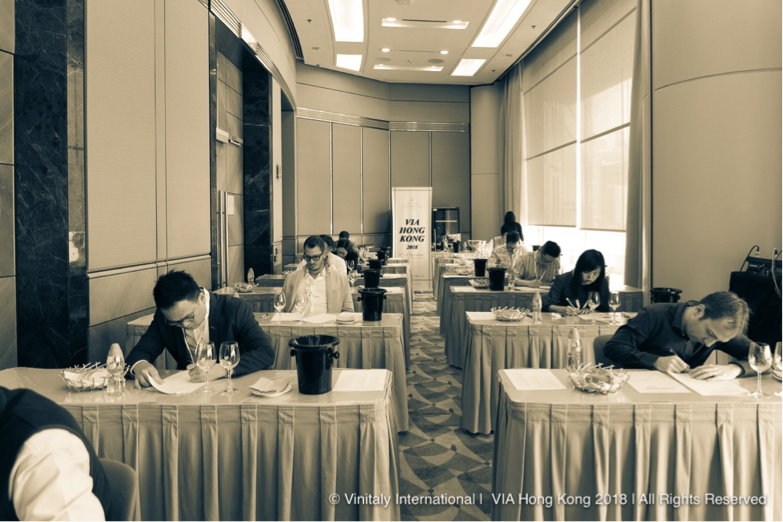 The ongoing educational efforts of the Vinitaly International Academy have been particularly forceful in 2018, with VIA running its Italian Wine Ambassador certification courses in Chengdu (China) in March, in Verona in April before the Vinitaly trade fair, and in Hong Kong in November. In Chengdu, 8 new Italian Wine Ambassadors joined the community, while in Verona 23 candidates became Ambassadors and 2 obtained VIA’s highest title, the Italian Wine Expert. The Hong Kong edition certified 7 Ambassadors and 2 Experts and saw the debut of the re-formatted curriculum and of the new Faculty members Sarah Heller MW and Henry Davar, the first a Hong Kong-based Master of Wine and VIA Italian Wine Ambassador, the second an American wine educator and wine business development manager as well as VIA Italian Wine Expert. 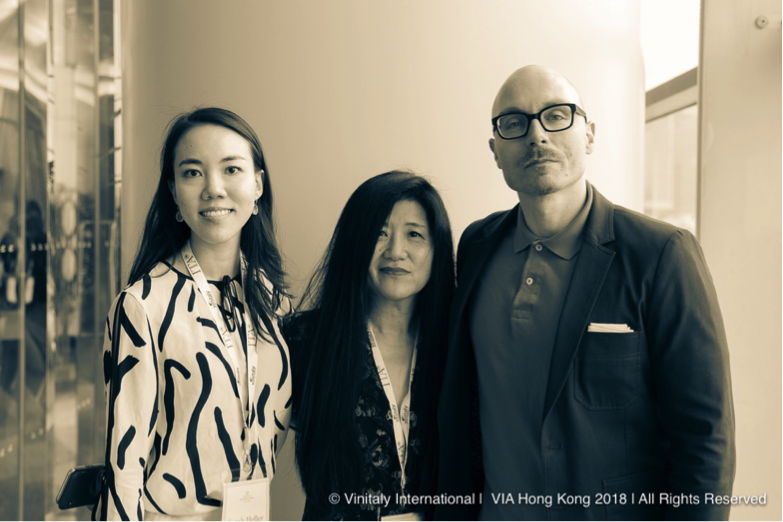 The Hong Kong edition came after a busy summer for VIA Founder Stevie Kim and her team who worked to bring the Vinitaly International Academy project to the next level. Following the appointment of Heller and Davar in June, in July vine genetics academic Attilio Scienza was nominated VIA Chief Scientist and Italian trade associations Federvini, Federdoc, FIVI Vignaioli Indipendenti, and Unione Italiana Vini were called to form the Institutional Advisory Board. In addition to being the academic guarantor of the program, Prof. Attilio Scienza lends its expertise to VIA to connect the world of wine education in Italy with wine education abroad. Advisory Board members Federvini, Federdoc, FIVI Vignaioli Indipendenti, and Unione Italiana Vini have given their official support to the implementation of the so-called VIA Ecosystem, the educational and administrative infrastructure that engages wineries, Italian local bodies such as consortiums, and professionals from all over the world that are interested in learning about Italian wine. I am grateful for these 170 VIA-certified Italian Wine Ambassadors and Experts worldwide. It is a result that my team and I achieved slowly, yet steadily and persistently. Our community, however, is larger, since over the years we engaged 450 wine professionals and hopefully inspired them to continue learning about Italian wine! With the development of the VIA Ecosystem the plan is to build up to a more significant number of international wine pros who are highly knowledgeable about Italian wine. VIA aims to become the benchmark for Italian wine education and promotion and I am cautiously optimistic that, with the new members and the reformatted curriculum, we are on the right track. Stay tuned for a sparkling 2019 in the name of Italian wine! I think the thing that students find both more accessible and challenging is the tastings. So, we are really making an effort to introduce as many Italian wine styles as possible in the theoretical lectures and really make them understand by tasting what the difference in grape varieties and differences in territories are. However, after going through this tasting process analyzing all these new grape varieties in depth, taking that knowledge and immediately going and doing a blind tasting is tough. It’s always going to be something that students will have to keep working on.” VIA Faculty Henry Davar adds that despite the difficulty of the blind tasting the response during the course in Hong Kong was positive: “In our experience just in Hong Kong this time around we found that students were able to recognize the grape varieties. We’ve offered the tastings of the Gavi di Gavi (Cortese grape) and Amarone della Valpolicella for example, two very typical and very specific styles of wines that many of our students were able to pick out in a blind tasting. So, we are seeing that the theoretical education is being matched by the experience that our students are already bringing. For 2019, two dates and locations for the Italian Wine Ambassador courses have been confirmed: February 18th to 22nd in Los Angeles, California, and March 29th to April 2nd in Verona, Italy. Enrolment for both dates is now open and additional information can be found on the Vinitaly International Academy course page. In early 2019, the Vinitaly International Academy will also run the intermediate-level Italian Wine Maestro course, a new certification that will prepare wine professionals for the advanced-level course Italian Wine Ambassador. Next year, VIA will also launch the Italian Wine Educator program, an online course granting Italian Wine Ambassadors the license to teach Italian Wine Maestro courses and a new beginner-level certification course currently under construction, the Italian Wine Fellow, the latter aimed at Italian wine lovers worldwide.